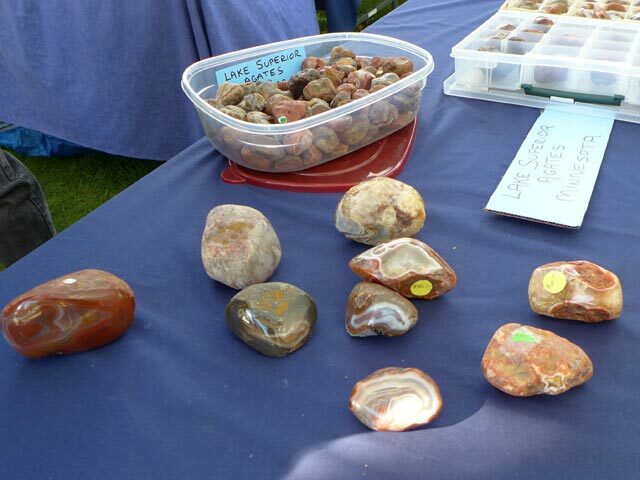 See more Agates & advice on using tumbling pellets to tumble and polish agates. 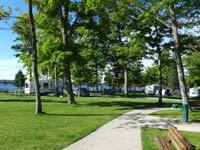 We noticed however that a huge number of cars arrived on the first morning of the event from people who either lived in the area or who were staying a lodges or motels in the Newberry, Michigan area. 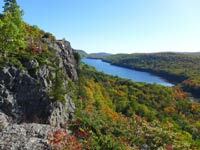 Muskallonge State Park, while on Lake Superior, is also in a quite remote area. The paved county road that goes north from Newberry to the park ends at the park. Only sand roads go east or west from there. So I was quite surprised at the number of people who commuted to the park for the event. After attending, I can see why it is so popular. 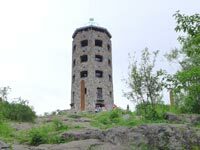 You might be interested in a blog post, pictures and a video on the Rock On Agate Festival I did for our ScenicPathways Travel Blog . . . but I'll add some more pictures and more detailed event information here. 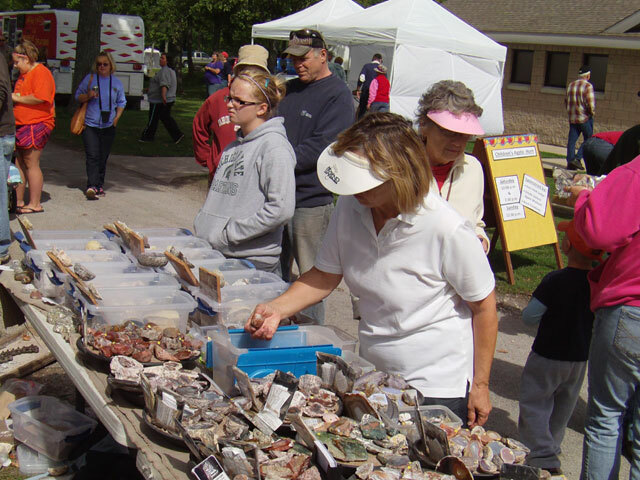 Following a tip from fellow beach rock and agate hunter, Jeff King, we learned about this unique annual festival held the second weekend in September. 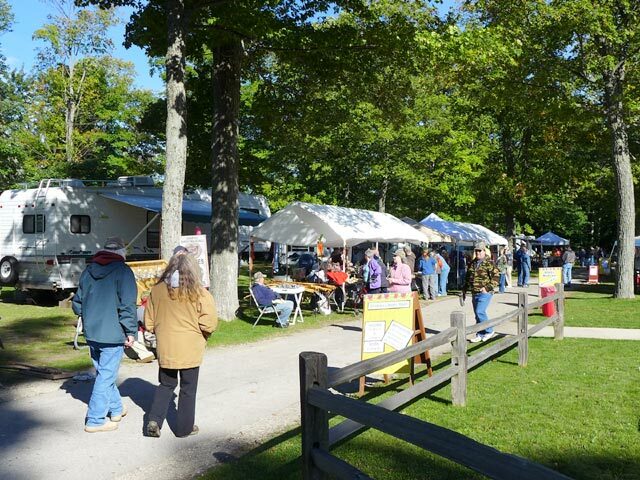 About three rows of campsites at the park are set aside for vendor booths and presentation exhibits. There were also tents set up near the washroom building for exhibits and presentations. I would guess that the majority of the remainder of the campsites were occupied by people like us who wanted to attend the event. So we recommend making your campsite reservation early if you want to attend next year's show. 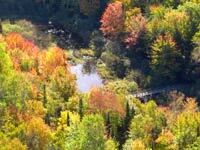 If you can't get a campsite here there are two private campgrounds near Newberry or the Tahquamenon Falls State Park campground close to Paradise, Michigan. 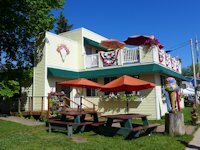 Paradise and Newberry also offer some decent motels if not camping. 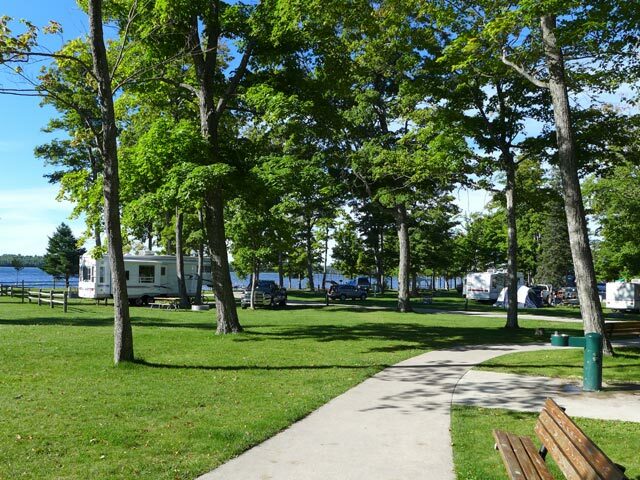 Muskallonge State Park's Campground is well-maintained, with shade trees and grass throughout the park. 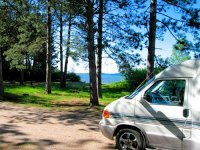 The park borders on two lakes, Lake Superior on the north side, and Muskallonge Lake on the south side, but the campground is on Muskallonge Lake. 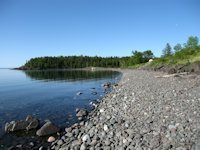 The park's Lake Superior agate beach is about a 1/4 mile walk from the campground. 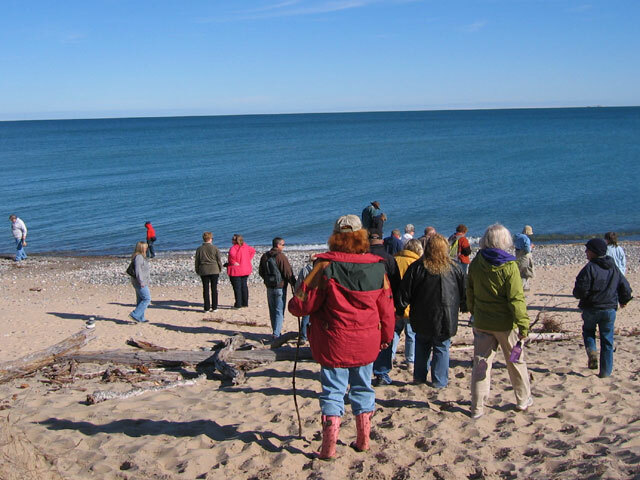 Agate hunters attending Jenifer Lasslet's hands-on workshop on finding Lake Superior Agates storm the beach to find their prizes! 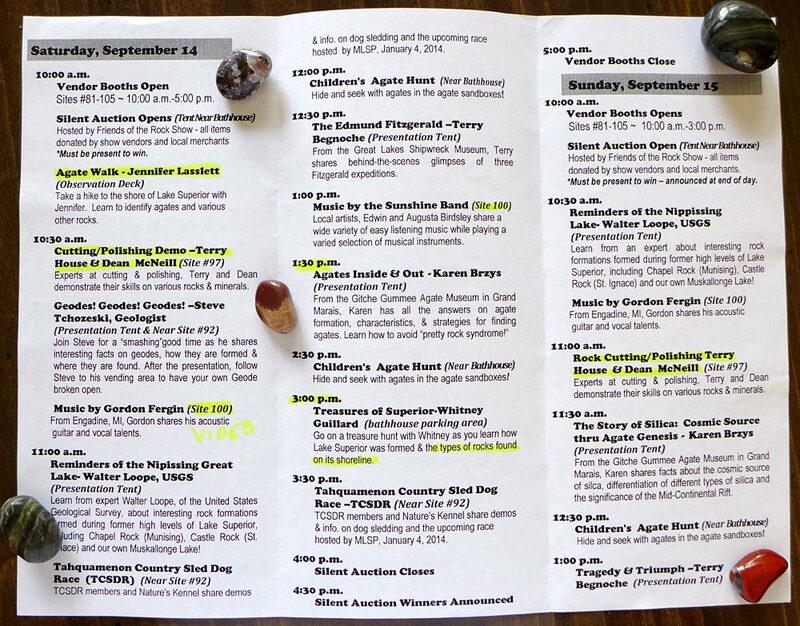 Here's a list of Saturday's programs and presentations; most were duplicated again on Sunday. One of the most popular events were the cutting and polishing demonstrations by Terry House, Dean McNeill and their colleagues. 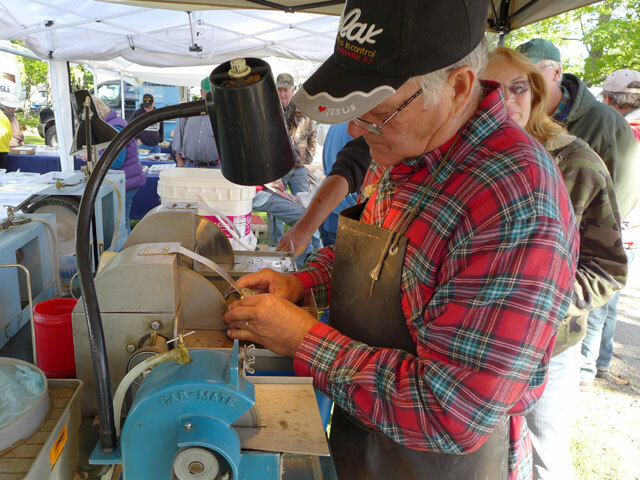 These guys generously donated their time, expertise, and equipment to cut and polish a number of samples contributed by festival attendees. Great job fellas. Thanks for your help. Early the first morning of the Rock On Agates Festival before the crowds arrived. Jo inspecting some of the agates and rocks on display and for sale. Here are some that were found on Minnesota's North Shore Lake Superior beaches. 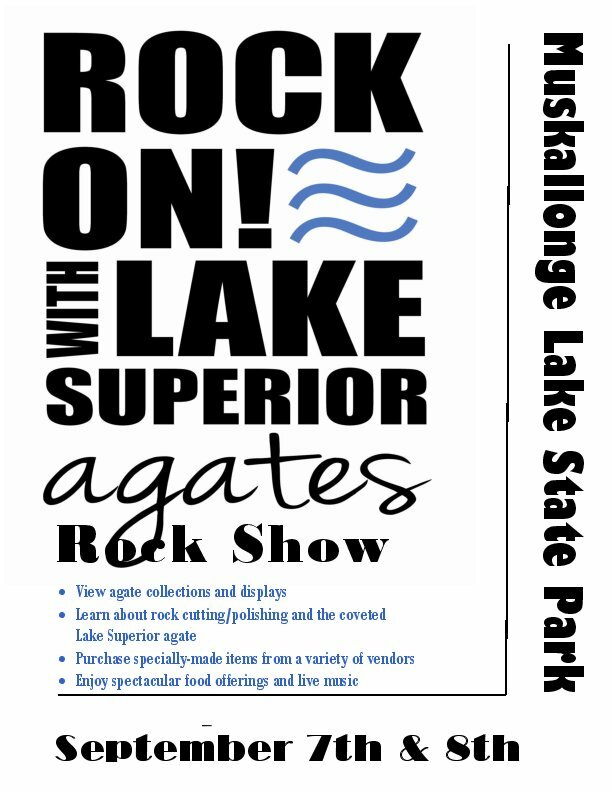 You could buy unpolished Lake Superior Agates for as little 3 for a $1; a fact causing much embarassment to those of us who have spent hours unsuccessfully searching for agates on Lake Superior's beaches! 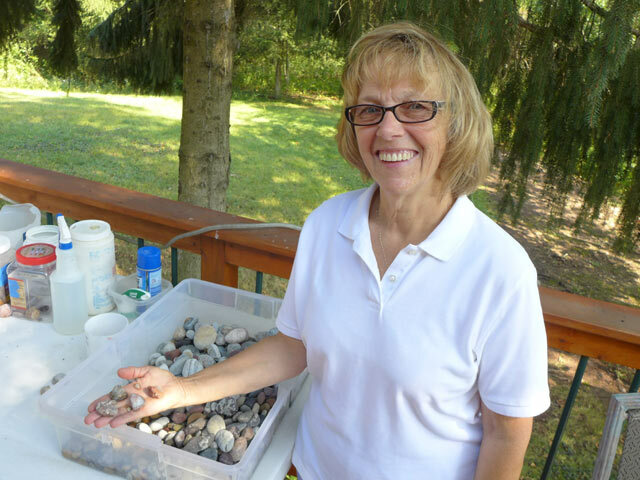 Jo, who learned a lot from presentations and displays at the Rock On Festival on how to find Lake Superior Agates on the beach, proudly shows off her "catch" on our deck back home. She has declared herself the champion agate hunter in our household. 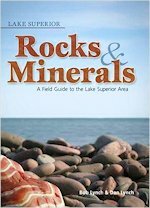 In the background of the photo on the left are some of the boxes of previously collected Lake Superior rocks that she has been inspecting and categorizing. 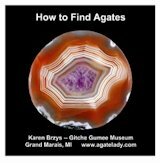 After having read Karen Brzys latest Agate Guide Book (see review lower down the page) and learning more about agate characteristics she has discovered more than 10 more agates amongst our rock collection. 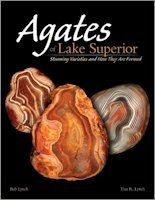 This pleased me because most of these undiscovered agates were found by me! 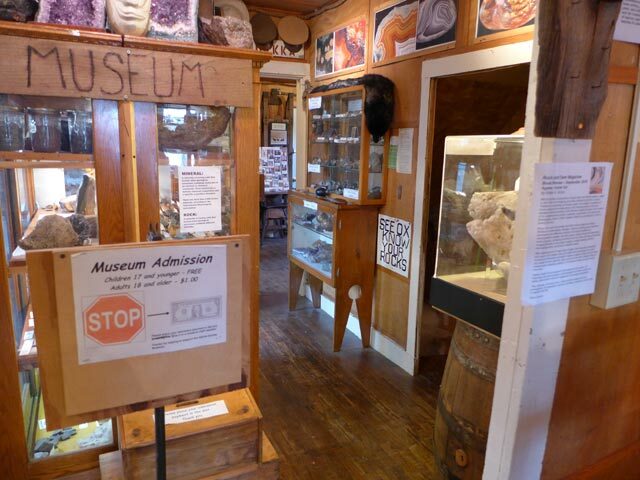 See more on the Museum and Rock Picking/Agate Hunting on Grand Marais, Michigan beaches. 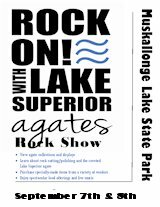 The 2018 10th Annual Rock On Agate Festival will be held held Sept 8 & 9th at Muskallonge Lake State Park. 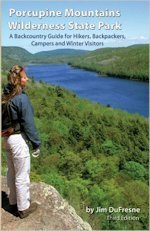 Muskallonge State Park Website. 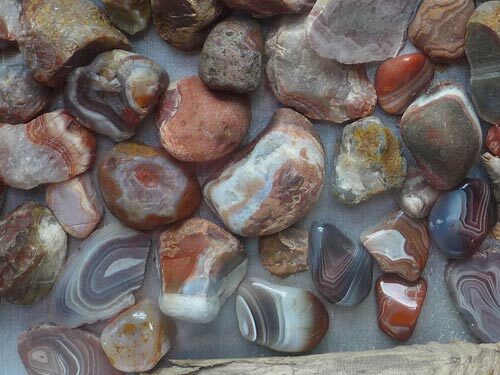 See our Pictures and Video from an Agate Hunting Trip to Black River Harbor near Ironwood, Michigan. 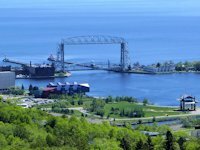 Marie Frazier, who lives in central Minnesota, has created a number of unique jewelry items from Lake Superior Agates and other gemstones. 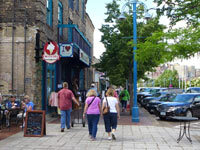 See her Lake Superior Agate Jewelry Website here.